Key difference: The arrangement of atoms in a molecule helps determine its polarity. A molecule is said to be polar, if it has a positive and a negative charge. A non-polar molecule is a molecule with less charge. In chemistry, polarity refers to the separation between electric charges of a molecule or its chemical group having an electric dipole or multi pole moment. Polar molecules interact through intermolecular bonds and hydrogen bonds. Molecular polarity depends on the difference in electronegativity between atoms in a molecule. Polarity, also determines a number of physical properties like surface tension, melting and boiling points, and solubility. Polarity is expressed due to the differences in electro negativity of an atom. It gives a measurement of an atom to attract electrons in a bond of a molecule. The Pauling scale is used to determine the charge values. If the charge difference between the two atoms is larger than 1.7, then the bond will be ionic. For a bond to be a polar, the charge should not be greater than 1.7. Depending on the charge difference, the polarity can be changed. This difference may be higher or lower. The bond in the electron pair is pulled more by another atom, as compared to the already present atom which makes the bond. This results in an unequal distribution of electrons between the two atoms. 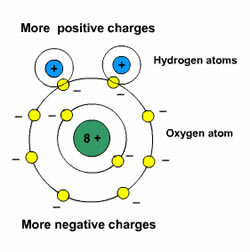 Due to the uneven sharing of electrons, one atom will have a slight negative charge, whereas the other atom will have a slight positive charge. Now, the atoms have partial negative or positive charges. The atom with higher electronegativity gets a slightly negative charge, and the atom with lower electro negativity gets a slightly positive charge. Polarity means the separation of the charges. These molecules have a dipole moment. The Dipole moment measures the polarity of a bond. Polar substances interact with other polar elements. A non-polar molecule does not have enough charge. Non-polar molecules are distributed in a manner of symmetry and do not have a large number of electrical charges on them. When two atoms or two same atoms have the same electron bond between them, the atoms pull the electron pair. This pull helps them share electrons and this kind of bond sharing between molecules is known as non-polar covalent bonds. Polar substances have a positive and a negative charge on the atom. Non-Polar substances do not have large charges on the atom attached. They have electrical dipole movement. They do not have any dipole movement. There is no charge separation. They interact with other polar substances. They do not interact with other polar substances.